18 May DUNK CHRISTIAN MORALDE! Wednesday, May 18, 2005 marks the 2005 graduation carnival at the Fashion Institute of Design & Merchandising. 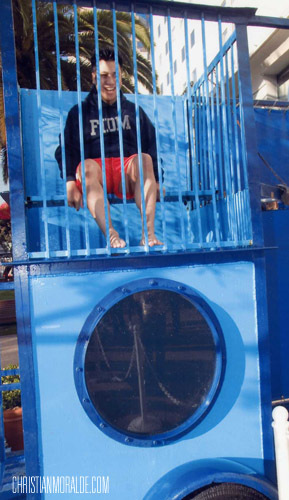 Starting at 4:30 p.m., at the downtown Los Angeles campus, participants of the carnival will have an opportunity to DUNK CHRISTIAN MORALDE into a dunk tank. As the on-air host of FIDM’S debut Fashion Show in 2005 (featured on PBS station, KLCS,) Moralde has become a popular face at FIDM. Asides from the dunk tank, the carnival will feature food, games, and prizes. Sponsored by FIDM and the Alumni Association, attendance is by invitation only.